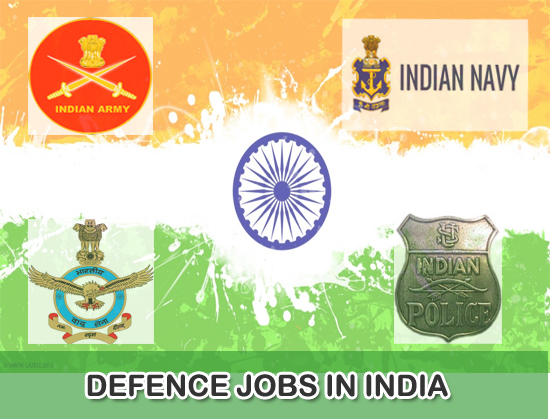 Latest & Upcoming Defence Jobs in India 2019 | All India Police Jobs (i.e) Indian Army, CRPF, BSF, Indian Air Force, Indian Navy, GD Constable etc. Exam Notification in One Place. Latest Defence Jobs 2019: Been searching lately for Defence Jobs in 2019? Then you are in right place to get information about Indian Upcoming & Latest Defence openings that are officially released by government of india. Defence jobs comes under central government sector and Indian Defence Force is one of the most reputed and powerful defence in the world. So getting police jobs in such organization is definitely great thing. Without wasting much time let’s get proceed to know details about Defence Jobs that might help the job searchers in India. Aspirants who had completed 12th/10th/Diploma/Engineering pass and looking for air force jobs, indian navy jobs, ministry of india jobs, may use this page to find a right job. We have tried hard to gather all the information. Indian Coast Guard Recruitment Civilians & Various Posts Check Advt. If you still have any doubts then in such situations we always suggest aspirants to visit Official site of ministry of defence at www.mod.nic.in. Every year the ministry of defence announces numerous vacancies for different departments for various positions. Candidates can go through the information and can apply for Defence openings if they are suitable and capable of working in given post. Our team has tried to collect details that are officially released by ministry of defence. As soon as the candidates open recruitment they will be redirected to a page where they can find all the data that is given in a detailed format. Although the Ministry of defence control all indian defence departments but when it comes to hiring responsibility is handed over to Union Public Service Commission which is also know as UPSC. Candidates who will apply for Indian Defence Vacancies 2019 have to remember that before actually getting placed into organization they need to cross all selection rounds which will be conducted as part of selection procedure. UPSC will arrange various examination and interviews. Applicants will get job only after clearing them. Basically Indian Defence is categorized into three departments, and they are Indian Army, Indian Navy, and Indian Air Force.And the aim of all departments is national security, although they work in different environments. These all departments will work under the control of ministry of defence. Aspirants can choose the department whatever they are interested in and can apply for jobs if they are satisfying all the rules and eligibility. Candidates who will get placed in the army has to work in the border while the aspirants of Indian Navy have to work in sea borders while the air force role is to work in air to protect the country. On our site www.dailyrecruitment.in, you can check the updated Defence jobs recruitment notifications for both fresher and experienced candidates, and can apply for the post which is suitable to your qualification. There are many Indian Defence Jobs 2019 for 10+2, Diploma, ITI pass candidates need to have minimum 10th/12th for many vacancies. Also there are other recruitment in Indian Defence that may require higher education qualification like Degree, graduation, diploma etc…, Recruiters will hire the aspirants after doing a clear medical examination and also some physical efficiency test. To know more information related to Defence Openings check this page quite often so that you can notice if there are any new vacancies. We made this page for job seekers who are searching for latest defence jobs vacancies in India 2019. Hope the data is clear and informative. Visit this site regularly. And also like and bookmark this page so that you will be notified instantly whenever we update this page with new recruitment.